Both the Office of the National Coordinator for Health Information Technology (ONC) and the Centers for Medicare and Medicaid Services (CMS) have introduced proposed rules on Target Data Blocking, which, if properly tailored and modified, have the potential to substantially impact Accountable Care Organizations (ACOs), Independent Physician Associations (IPAs), Clinically Integrated Networks (CINs) and other value-based care organizations (VBCOs) by greatly expanding data transparency as between payers, including Medicare Advantage Organizations (MAOs), and VBCOs. The CMS proposed rule on target data blocking is designed to transition the industry towards interoperability, and further builds upon CMS’ goals, deriving from the 21st Century Cures Act and Executive Order 13813, to improve access to, and the quality of, information that Americans need to make informed health care decisions, including data about health care prices and outcomes, while minimizing reporting burdens on affected plans, health care providers, or payers. According to the ONC, their proposed rule on target data blocking would implement certain provisions of the 21st Century Cures Act, including more fully and completely describing the conditions and maintenance of certification requirements for health information technology (health IT) developers under the ONC Health IT Certification Program (Program), the voluntary certification of health IT for use by pediatric health care providers, and by insulating certain reasonable and necessary IT activities that do not constitute information blocking. The implementation of these provisions would advance interoperability and support the access, exchange, and use of electronic health information. The proposed rule would also modify the 2015 Edition health IT certification criteria and Program in additional ways to advance interoperability, enhance health IT certification, and reduce burden and costs. For VBCOs, expansion and clarification of the 21st Century Cures Act prohibition on “information blocking” presents a rare opportunity to create a more level playing field as between VBCOs and payers by forcing the enhancement of payer data transparency, which is critical for VBCOs to gather and/or review the data and methodologies held/employed by payers to calculate patient risk scores and to confirm the accuracy of payer-calculated accrued shared savings (or shared risk). Additionally, VBCOs, being in the unique position of having comprehensive in-house data analytics departments and proprietary healthcare data analytics methodologies or software, must be certain that the new Health IT requirements imposed by the proposed rulemakings are both clear and reasonably implementable from both a cost and technological standpoint. 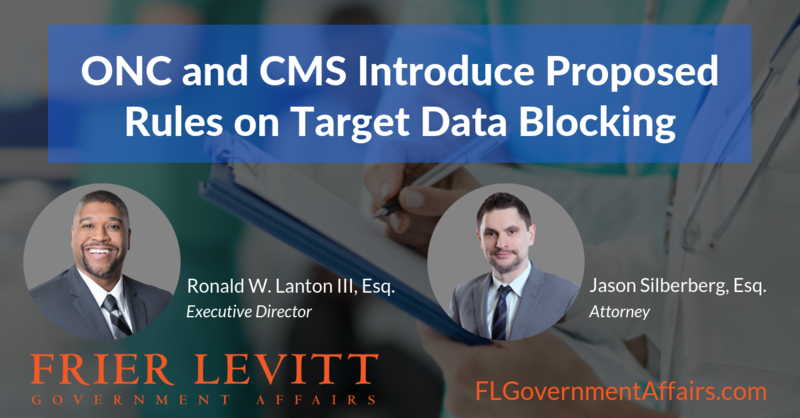 Submitting targeted, concise comments to CMS and ONC expressing questions and concerns relevant to the above issues is one means of ensuring your company’s continued success in the fast-changing value-based care landscape. Indeed, even if the agencies disagree with a proposed suggestions for improving the rules, in so doing, they will have to provide reasons therefor, thereby providing you with invaluable advanced guidance for full compliance with the rules prior to their implementation. There are multiple ways to respond to the ONC’s “21st Century Cures Act: Interoperability, Information Blocking and the ONC Health IT Certification Program” and/or CMS’ “Medicare and Medicaid Programs; Patient Protection and Affordable Care Act; Interoperability and Patient Access for Medicare Advantage Organization and Medicaid Managed Care Plans, State Medicaid Agencies, CHIP Agencies and CHIP Managed Care Entities, Issuers of Qualified Health Plans in the Federally-facilitated Exchanges and Health Care Providers” proposed rules. Contact Frier Levitt Government Affairs to have your voice heard. 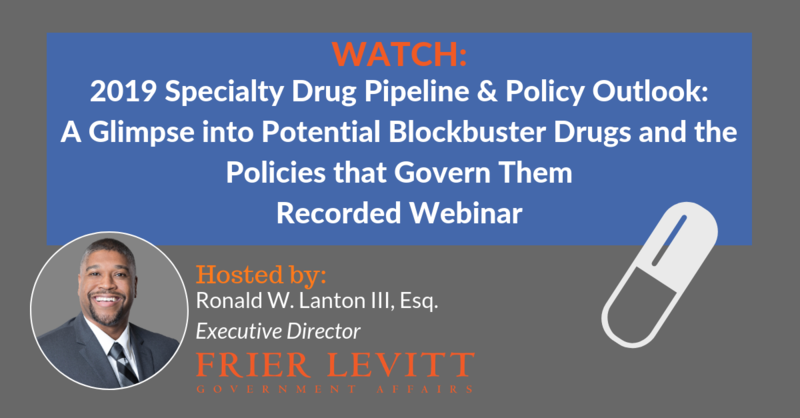 The Food and Drug Administration (FDA) is out with a new proposed rule targeting pharmaceutical manufacturer and specialty pharmacy stakeholder interests. With the new proposed rule, the FDA is looking to amend its regulation that defines “biological product” to incorporate changes made by the Biologics Price Competition and Innovation Act of 2009 (BPCI Act), and provide an interpretation of the statutory terms “protein” and “chemically synthesized polypeptide.” Under this interpretation, the term “protein” would mean any alpha amino acid polymer with a specific, defined sequence that is greater than 40 amino acids in size. A “chemically synthesized polypeptide” would mean any alpha amino acid polymer that is made entirely by chemical synthesis and is greater than 40 amino acids but less than 100 amino acids in size. The comment period for the new proposed rule on biologics is now open. The deadline to comment is February 25, 2019. Biologics is a cutting-edge sector within the healthcare industry. Since biologics are not traditional drugs, they will need their own classification as they become more utilized. 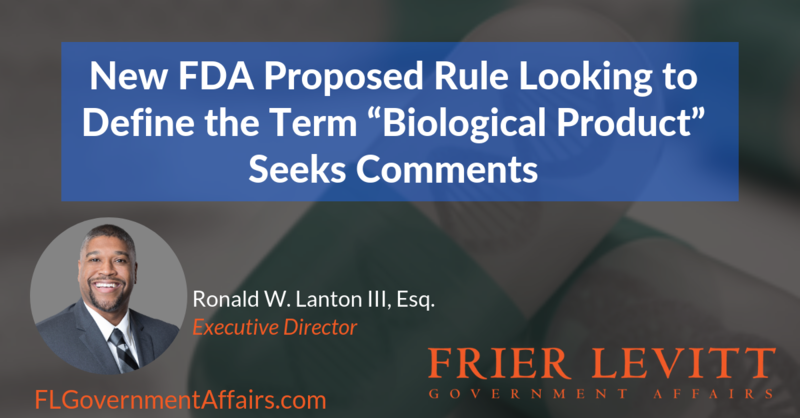 Reimbursement and regulatory oversight involving safety of biologics will depend on how the term “biological product” is defined in this proposed rule. 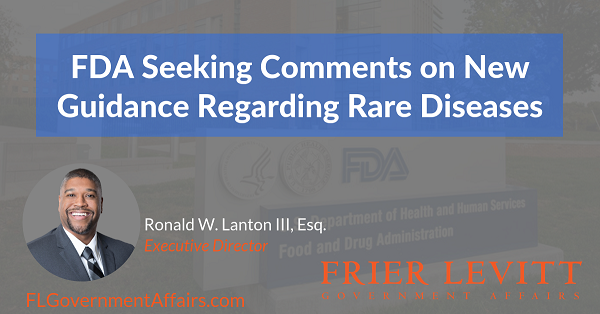 Pharmaceutical manufacturers and specialty pharmacy stakeholders can participate in this decision by submitting comments. Contact Frier Levitt Government Affairs today to have your voice heard on this very important topic. 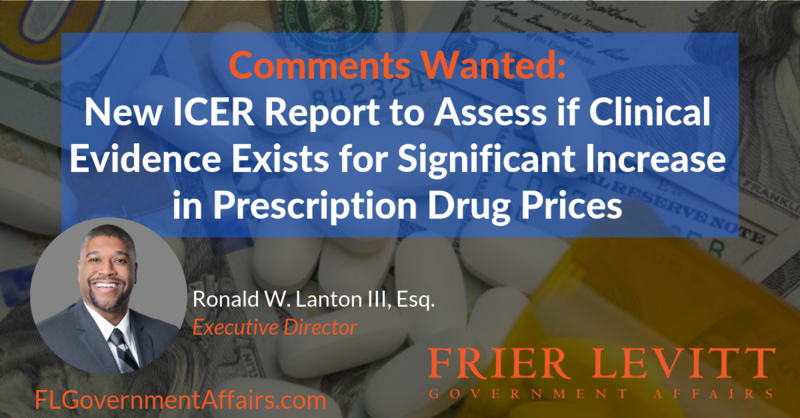 Public comment is being sought on the Institute for Clinical and Economic Review’s (ICER) recently posted draft protocol titled the “Unsupported Price Increase” (UPI) report. 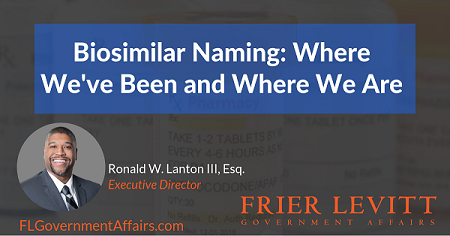 This report analyzes significant prescription drug increases and looks to determine whether or not new clinical evidence exists that could be used to support those increases. Once finalized, the protocol will guide the development of the first of these annual reports, currently scheduled for release in October 2019. The comment period closes on February 13, 2019. ICER is an independent non-profit research institute that produces reports analyzing the evidence on the effectiveness and value of drugs and other medical services. They are quietly becoming a strong influential force on government policy. The recent announcement of ICER’s collaboration with the Department of Veterans Affairs (VA) Pharmacy Benefits Management (PBM) Services to support VA coverage and price negotiations with drug manufacturers makes it clear that their influence on drug pricing will only continue to increase in the future. If you are a manufacturer, GPO, wholesaler or similarly situated life science or healthcare stakeholder, it is imperative that you participate to ensure having your voice heard. Contact Frier Levitt Government Affairs today for assistance in submitting your comments for this very important policy development before the upcoming deadline. 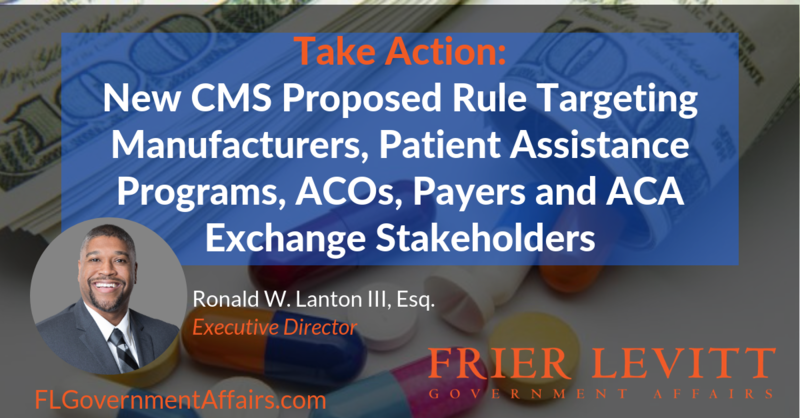 The Centers for Medicare and Medicaid Services (CMS) has issued a new proposed rule targeting Accountable Care Organizations (ACOs), payers and Affordable Care Act (ACA) exchange stakeholders. The proposed rule, titled “Patient Protection and Affordable Care Act; HHS Notice of Benefit and Payment Parameters for 2020“, reflects a priority of the Administration around the Patient Protection and Affordable Care Act (PPACA) of reducing fiscal and regulatory burdens across various areas within the law. This proposed rule has several components that affect different stakeholders. Copay accumulators are being implemented by insurance companies and Pharmacy Benefit Managers (PBMs), harming patient access. With this payor program, the value of copay assistance cards/coupons issued by manufacturers do not count towards out-of-pocket costs that are applied toward deductibles. The result has caused a cost shift onto consumers and away from employers and payers. 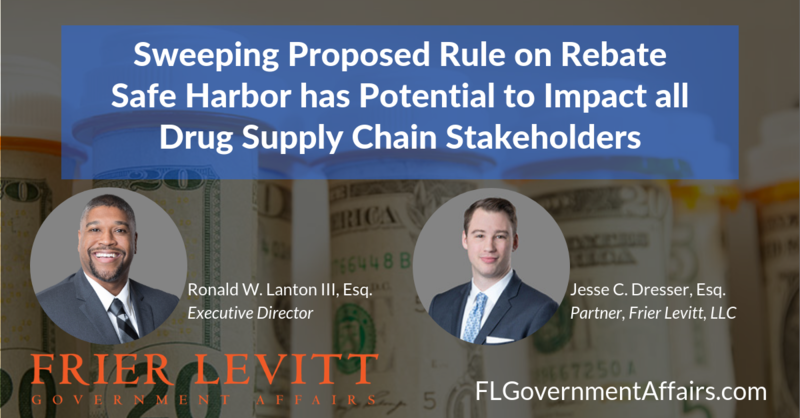 Participating in this proposed rule is crucial for manufacturer and patient assistance programs to maintain patient access and stop unnecessary risk shifting from occurring in consumer spending. We can help advocate your concerns. Specifically, the proposed rule would set forth parameters and provisions related to the risk adjustment and risk adjustment data validation programs, cost sharing parameters, and user fees for Federally-facilitated Exchanges and State-based exchanges on the Federal Platform. The proposal outlines changes that would allow greater flexibility related to the duties and training requirements for the Navigator program and proposes changes that would provide greater flexibility for direct enrollment entities, while strengthening program integrity oversight. 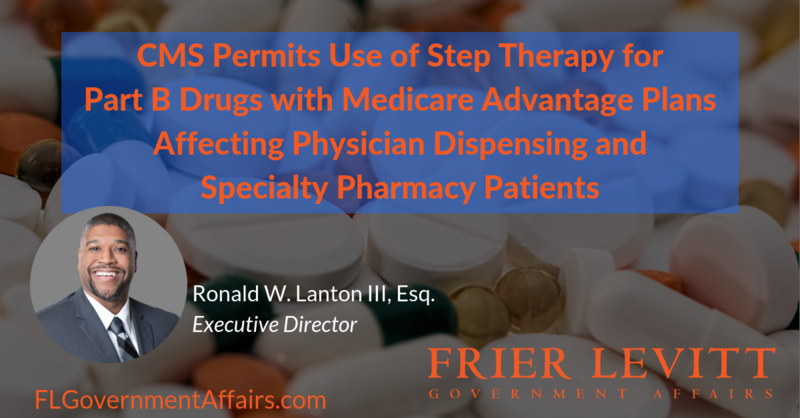 Lastly, the proposal discusses policies that are intended to reduce the costs of prescription drugs. This includes proposed changes to Exchange standards related to eligibility and enrollment, exemptions, and other related topics. The Administration has been making several changes to the ACA via regulation, as earlier Executive Orders described how regulatory changes would be used to make drastic reductions to the ACA. If you have an interest in the ACA or a direct one based off of an interest in the Exchanges, it is advised that you participate in this rule to ensure that your interests are represented. Not doing so will subject your organization to whatever policies may or may not arise from this rulemaking, potentially placing your organization and your priorities at a disadvantage. Frier Levitt Government Affairs (FLGA) helps stakeholders comment on proposed regulations. FLGA understands the nuances around industry and has strategies that can help successfully communicate stakeholders’ positions to CMS. The deadline to comment is February 19, 2019, so it is important that you contact Frier Levitt Government Affairs today to make sure your voice is heard. The Office for Civil Rights (OCR) has issued a Request for Information (RFI) seeking input from the public on ways to modify the Health Insurance Portability and Accountability Act (HIPAA). OCR intends to use the public’s comments to remove regulatory obstacles and decrease regulatory burdens in order to facilitate efficient care coordination and case management to promote value-based health care while preserving the privacy and security of protected health information. Covered entities and business associates often defer thorough HIPAA compliance due to the onerous requirements and/or limited administrative resources required to develop and enforce a comprehensive policy and procedure manual. However, this places these companies at significant risk. OCR’s HIPAA enforcement has, and will likely continue, to rise. This proposal offers providers an opportunity for physicians, hospitals and healthcare stakeholders to submit feedback to OCR highlighting certain obstacles they may face due to HIPAA regulations that do not meaningfully contribute to the privacy and security of protected health information. The deadline for the comment period ends February 12, 2019. 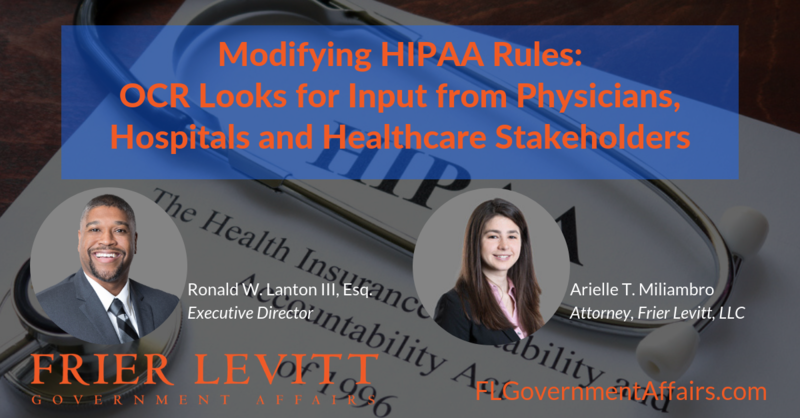 If you are a healthcare stakeholder and would like to participate, contact Frier Levitt Government Affairs today. We have several strategies to help you or your organization engage in this process and have your voice heard.